Bringt die Hüften zum schwingen yeah! Der Song geht ins Ohr. Am Anfang gefiel mir der Song ja noch viel schlechter. Aber auch so ein gutes Beispiel, dass eine Nr. 1 in Amerika in letzter Zeit nichts mehr aussagt über die Qualität des Songs, seit da nur noch R&B-Songs die Charts stürmen. Sehr kommerziell, leider. irgendwie hat der Song etwas, darum gebe ich eine 4! As far as dancefloors are concerned not bad, otherwise a stereotypical # 1 in USA in September 2003.
whoa...geiler Soundtrack und noch geilerer Hip Hop! Argh, nur schon der Titel vom Song...ohje...no thanks! Ich fühle mich regelrecht belästigt durch solche Songs. Ja, Bad Boys 2 war ganz witzig, der Soundtrack ist auch nicht schlecht, aber dieser Song wirkt bestenfalls für ein paar Sekunden im Kino, ansonsten ist er ziemlich mies. Één van de leukste rapplaten uit 2003. 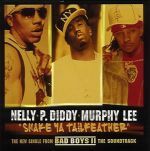 Een prima samenwerking tussen Nelly, P.Diddy en Murphy Lee. Vooral het refreintje spat er uit. Goed gedaan. ▒ Een redelijk drukke en vervelende plaat van "Nelly & Friends" uit eind september 2003 !!! Net te vervelend voor de 2 sterren !!! (NL Top 40: 6 wk / # 20) ☺!!! So great, one of the better rap songs of 2003. Den Film fand ich noch cool, darum passt auch der Song irgendwie dazu! Really don't like this. It's not the worst from any of them though. Eher durchschnittliche Nummer, knappe 4*. Really forgettable considering Nelly's career but because it's rap, it's not as bad as it could get. Video is too long and overachieved on the Chart. <br>For something so big it sure isn't very memorable is it. It's alright. There are some appealing elements (the beat, its catchiness) but it mostly doesn't evoke much from me. I can't call it dull but it doesn't effectively do what an upbeat and fun song should do imo. Definitely overachieved on the charts but I have no major issues with it. Nelly definitely has better tracks and worse ones. An important lesson learned in growing up is that Nelly brought almost nothing but jams to the radio in the early 2000s. He's clearly the highpoint of this single...which is not a difficult achievement. It's undeniably a bit of a mess, but it's a beautiful sight.